So many questions has been left unanswered in life, recently I got so bothered about few, especially the ones that relates to our personal life, our engagement, what we venture in, family and so on. I decided to focus on those that concerns me most - job, work or whatever we may call it. "Where do you work? what's your job like? How many hours do you work? Is it a flexible job? " “This Job is the best, great package. girlfriend! its flexible, I can work around my family. The incentive is very attractive"
These are some of the conversations we often have with friends and family. Everyone seems to desire for a better job, a bigger job, we want to gain new skills, learn more to become something better. We want to earn a higher salary, a better job title that demands respect. Also, we often come up with one or two reasons why our job is not good enough, like.... it doesn't pay my bill, no growth opportunities and so on. The reason for our complain is not just due to the fact that we are ungrateful for what we have at hand or perhaps because we are all a greedy individual who seems not to be content with anything in life; the reason is due to the fact that we want to do better, we all have the aspiration to be great, trying endlessly to find a sense of fulfilment In what we do. In dictionary the word “job” and “work” does not have much difference in terms of definition? Job was defined by Oxford dictionary as “a position of regular employment” while work was defined as “activity involving mental or physical effort done in order to achieve a result”. However, I noticed that the latter has more gravity in description. Nevertheless, today, both words are used interchangeably. Furthermore, the lack of adequate of understanding of both word can add to unnecessary anxiety. One things is a spade, another thing is to call it a spade. 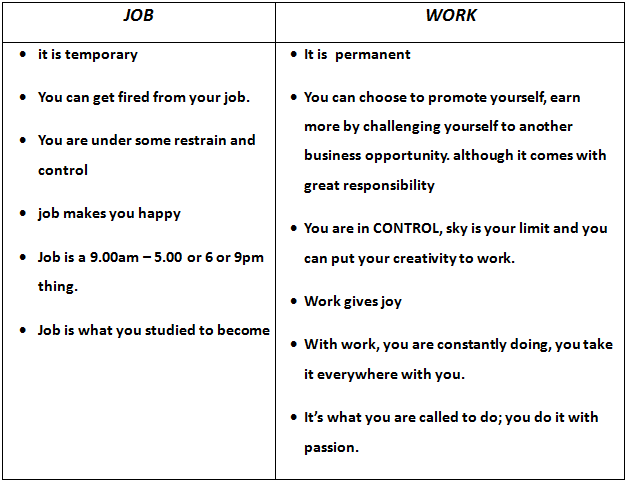 Job and Work in reality are two different entities and in the process of trying to understand the difference between the two, I stumbled on Myles Munroe explanation of the two, so I tried to put it on a table plus few that I added. Now, that we understand the two, the question we all need to ask ourselves is: am I doing my work or doing my job? Some might be working towards it, which is great. Others might be reading this and thinking that they have a lot on their plate; family to take care of, too much bills to pay off and the list goes on; the good news is you are not alone. But whatever your answers might be; nurture your dream and don’t let it die in you. Do your job well whilst nurturing that GIFT in you. Your gifts are in that tender place in our heart, longing to be freed. It lies in the very heart of your creativity and love. It comes with ease, you do it effortlessly. It’s what you exercise without any monetary motive or gain but actually it can turn out to be when you develop it and get it to the level of making it your work. I'm not saying that you should go and quit your job to rush and start that business idea that has been lingering in your heart for so long, no! It requires much more, it entails some reflection and planning. One thing I will like to stress is that your job now lays a good foundation for your work. All the skills you have gained over the years are all transferable to your work. It will make your journey much easier. Hold on to that CALL. Don’t let it fade away. I tried to think of something to add, but I could not come up with any. I guess this is because you did a great job with this piece. Am going back to see if I have set my gift free. Thanks for reminding me this truth.